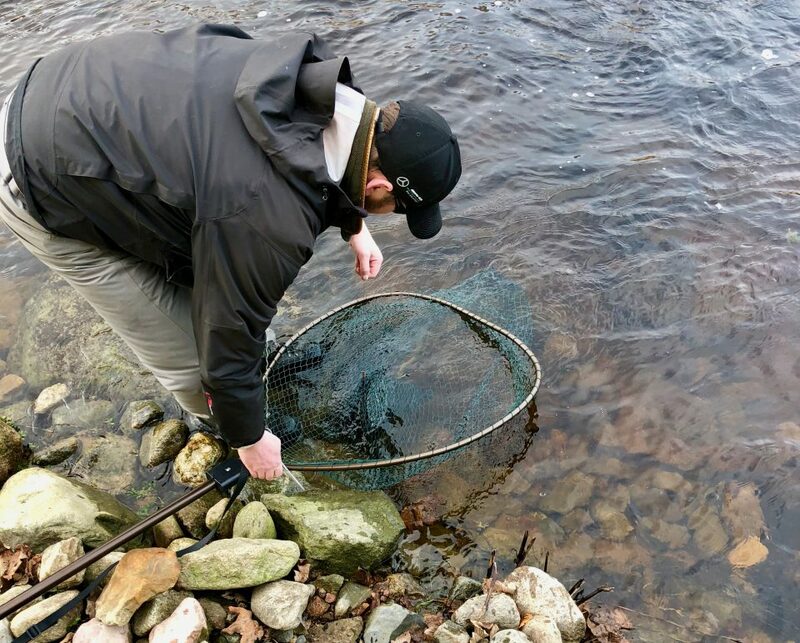 Chasing February silver on the majestic River Dee! The text message came through on my phone late in the afternoon. 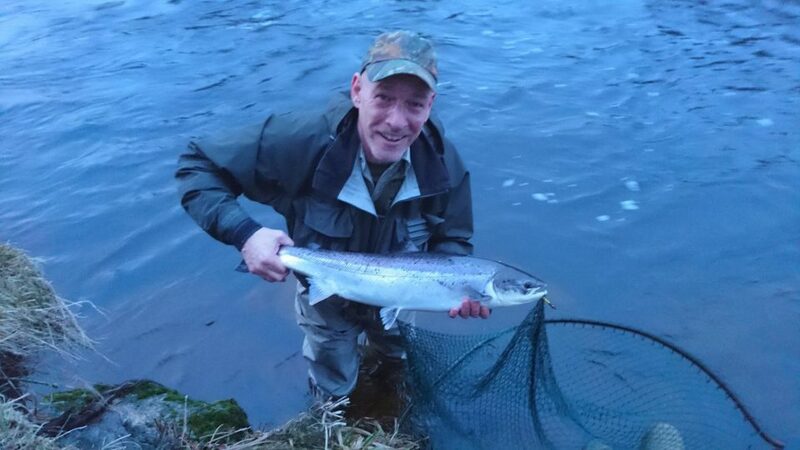 My friend Graham had just landed a fin perfect spring salmon from the beautiful Banchory Beat on the River Dee. This was like a shot in the arm as I could feel the adrenaline coursing through my veins. When I told my wife Samantha a big smile appeared on her face. Our three friends Graham, Bobby and George had been fishing an extra day and we would be joining the party, the following day. 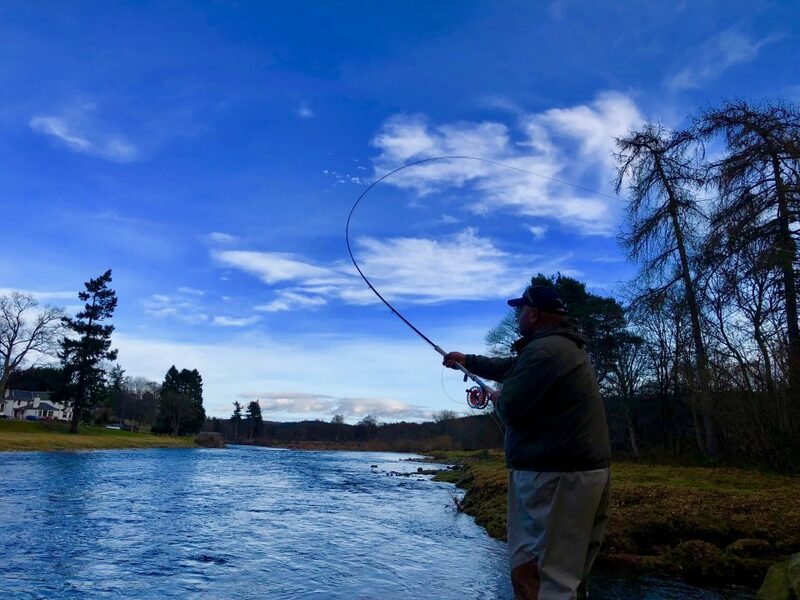 As well as the fresh springer there was plenty of good sport to be had as everyone had got their rod bent with some kelts during the first day. Samantha and I arrived at the beat the following morning and were greeted by the ghillie Brian Brogan. I have fished with Brian before and his enthusiasm is truly infectious. He had previously been a ghillie on the mighty River Tay for a number of years before he switched rivers. From the outset it was clear that Brian had an intimate knowledge of the beat which was great for us as we had not fished the Banchory Beat before. We enjoyed a coffee in the hut whilst chatting to the rest of the party. The fishing hut on the beat is truly magnificent. It boasts stunning views up and down the river. Through the large glass windows, you can almost see the entire beat. Myself, Samantha and George would be fishing on the left bank of the beat in the morning. We quickly tackled up with great anticipation for the day ahead. I decided to build my 14ft Snowbee Spectre fly rod and coupled it with one of the Snowbee floating Spey lines. I added a sinking polyleader as the water temperature was still very low being February. 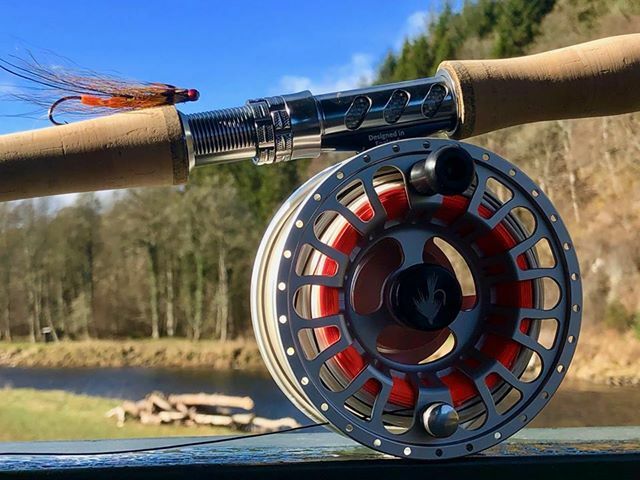 On the business end I opted for a two-inch gold bodied Willie Gunn copper tube fly. The rod is six pieces and I was interested to see how it would cope with casting a heavy tube fly coupled with a sinking polyleader. We fished some lovely pools in the morning including the Bridge Pool, Jock Adams and the Holly Bush. The pools fished perfectly with the fly and I was expecting the line to tighten. There was a stiff gusty wind blowing into my face which did not help casting. In spite of this I was really surprised at how the excellent Snowbee rod was able to cast a good line into the wind with minimal effort What was even more impressive was that being only a fourteen-foot rod it had no problem turning over a sinking polyleader coupled with a heavy weighted tube fly. Just before lunch Samantha managed to land two kelts. One of the fish gave her a fantastic tussle and for a few minutes we all thought it could have been a fresh fish. After a convivial lunch we were all keen to get back on to the water. We would be fishing the right bank in the afternoon. On some salmon beats when you fish often there are one or two pools where you don’t feel too confident. This could not be any further from the truth on the Banchory Beat. Brian showed us the water we would be fishing in the afternoon and I could honestly say every pool screamed salmon. 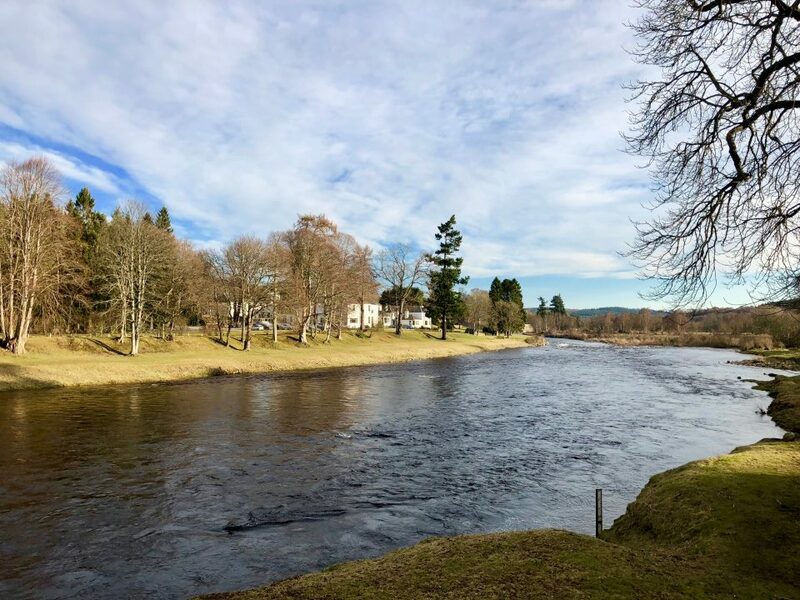 It was a pleasant afternoon as temperatures in Deeside hit fourteen degrees. It felt like spring had finally sprung. We fished hard and Samantha had a titanic battle for around twenty minutes. The fish stayed midstream in the fast current. After a number of hard surging runs the fish was finally netted. Unfortunately, it turned out to be a massive kelt. We finished what was a fantastic day a little after five. We arrived at the beat the following day a little worse for wear! The red wine and whisky had kept flowing late into the night. However, after a quick cup of coffee we were ready for action once again. Thankfully the wind had dropped and again it turned out to be another mild day. We fished the left bank in the morning. The pools fished even better as the water had dropped by a few inches. Graham briefly had a hold of something decent but unfortunately it did not stay on for long. After a leisurely lunch Brian showed myself and Samantha the magnificent Feugh Mouth Pool. It was a truly beautiful pool to fish. The River Feugh (one of the Dee’s main tributaries) enters the river just above the pool. 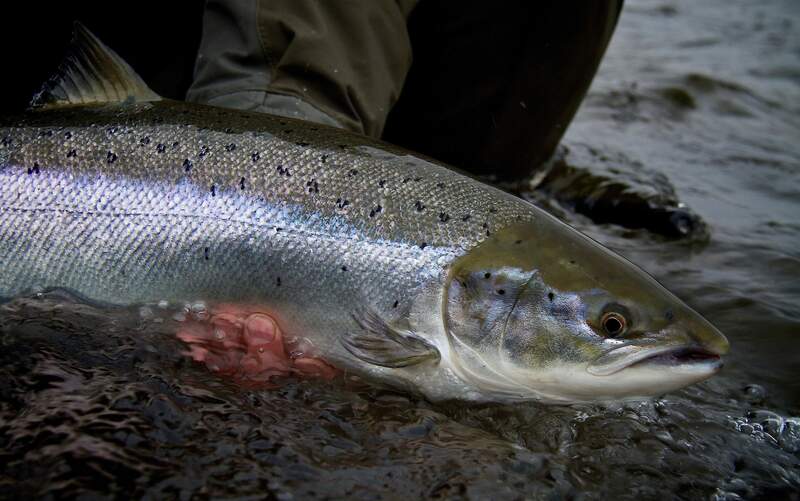 It is the prefect ambush point for a salmon with fast water leaving the pool. The pool itself had a lovely steady flow to it and the fly was swinging around in the current a treat. You were just waiting for that pull. I just could not believe it did not happen! By now there was only a couple of hours of daylight left. We decided to fish down the right bank one last time. We all fished hard covering the water to the best of our ability. George made brief contact with two fish. As the light began to fade we decided to go back to the hut for a whisky in front of the fire and admire the magnificent view. 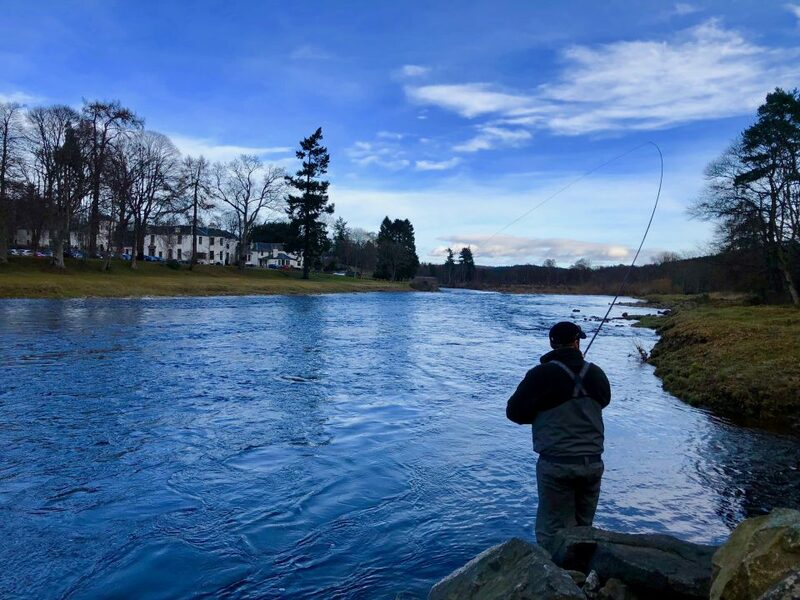 We had a fantastic time during our three days fishing on the wonderful Banchory Beat. We managed as a party to land one fresh salmon and numerous kelts. Everyone managed to get their rod bent. Brian was an excellent host, and his wealth of knowledge is a true asset to any angler fishing on his magnificent beat. We have already booked for next year but that might just be a bit too long to wait for some of us! 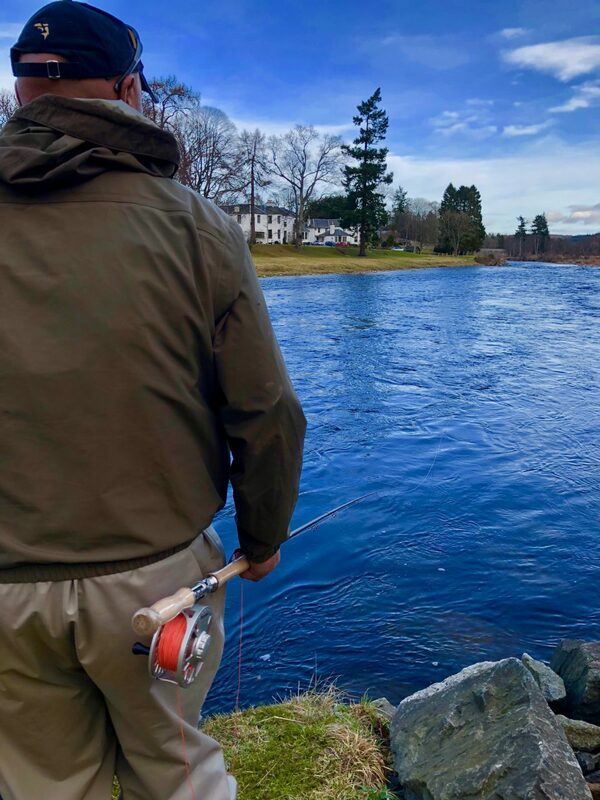 Salmon Fishing Holidays Scotland specialise in designing bespoke Scottish salmon fishing holidays and experiences that are tailor made to suit your requirements. 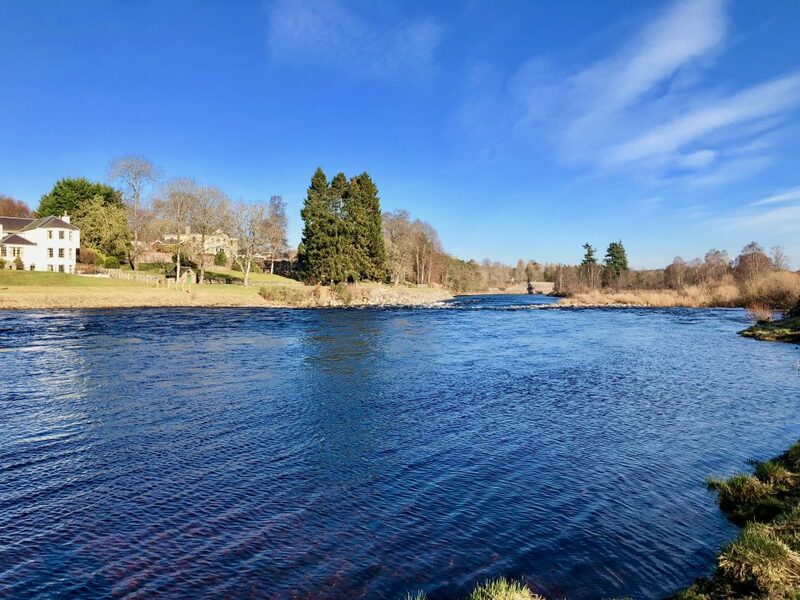 Our highly knowledgeable team, has over thirty-five years experience, of salmon fishing in Scotland which they use to make sure that you get the most from your Scottish salmon fishing holiday.